I continued with simple sweeps from underneath, teaching what Gordo (the guy who effectively created the half guard as a viable position) calls 'Plan B'. I don't think that's very descriptive, so I'm going with whizzer counter roll. Teaching & Sparring Notes: Thursday classes end up in a different format to the two mixed classes at MyGym, for three reasons. Firstly the Thursday is longer, the mat space is bigger and there tend to be less people. I often fit in two techniques rather than one, so tonight also inluded the toe grab sweep in what became a general recap of Monday and Wednesday. I added in the Bravo version of the toe grab sweep for variety too, which was interesting to watch in terms of how the students worked through it. Initially they were saying "cool, that's simpler," because Bravo doesn't switch his grips. He gets the underhook and grabs the foot, then sweeps from there. The smaller numbers on Thursday has the advantage that I often get to join in sparring, mainly during specific sparring. Rather than putting people into two king of the hill groups based on weight (like I do on Wednesdays, as that's the biggest class), Thursday it's a case of one person in the middle with everyone else switching in. 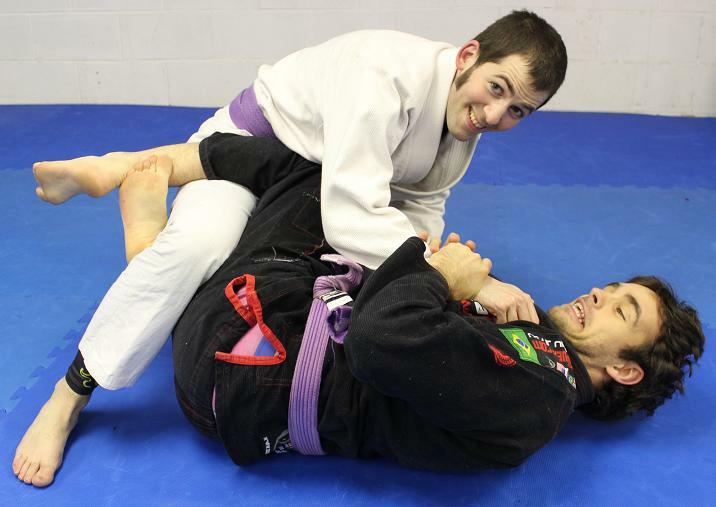 I therefore practiced passing, using the pressure pass and reminding myself of the Xande cross-face alternative. If you can't get the cross-face, you can stick your head next to theirs and use that control instead. My neck was a little sore after class, though I'm not sure if it was me doing that wrong, or a sloppy escape out the back I did later. Underneath, Braulio's arm shield worked well for me, to the extent that I think it actually fits better into my approach than the paw block. Keeping EstimaInAction in mind, I attempted to shift into deep half guard from there, but without much success (Braulio goes into the waiter sweep, whereas I prefer the Homer Simpson sweep: I wasn't getting either). Nevertheless, I felt considerably safer than normal, so I'll be sticking with the arm shield for the rest of this month. Another type of shield caused more problems. I am not getting anywhere using the knee shield, in terms of sweeping. I know that there is a viable scissor sweep into back roll from here, as I've used and taught that in the past, but I must be forgetting a key element (probably to do with their weight distribution). I can get the position, then end up uselessly straining to move them with the sweep. Back take might be a good one to throw in there too, as that can work well off the knee shield. Braulio's version is very different to the kick and reach I'm used to, as he does something with the belt on EstimaInAction. Something to try I guess, though I don't like techniques that rely on belt grips (unlike the gi, the belt can loosen and fall off, so it doesn't feel secure).